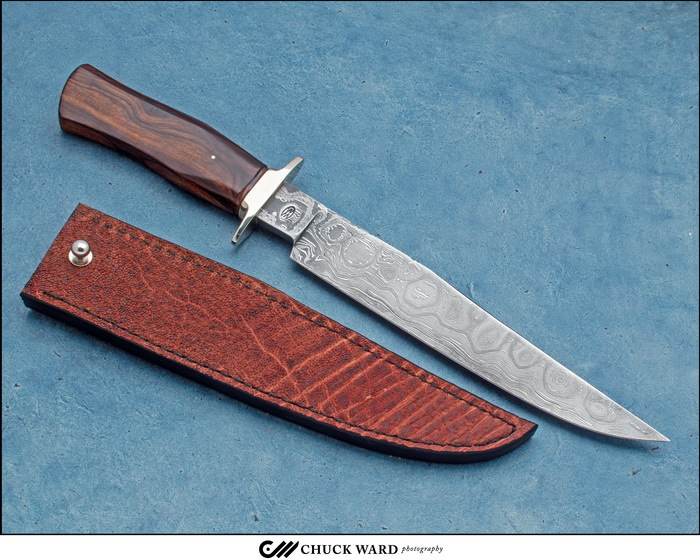 Bill Miller has has forged a Damascus Bowie Knife with a 9.75-inch blade of his Open Ladder Pattern Damascus. The ergonomic handle is Ironwood. Overall length is 14.75 inches. An elephant leather sheath by the maker is included. I have been making knives for 29 years. I make my own Damascus, everything from random patterned to pattern-welded mosaic in my blacksmith shop in Warsaw, Missouri. I make all sorts of knives including hunters, small and large to small swords. I use 1084, 1095 spring steel, 15n20, and L6 tool steel in my Damascus.